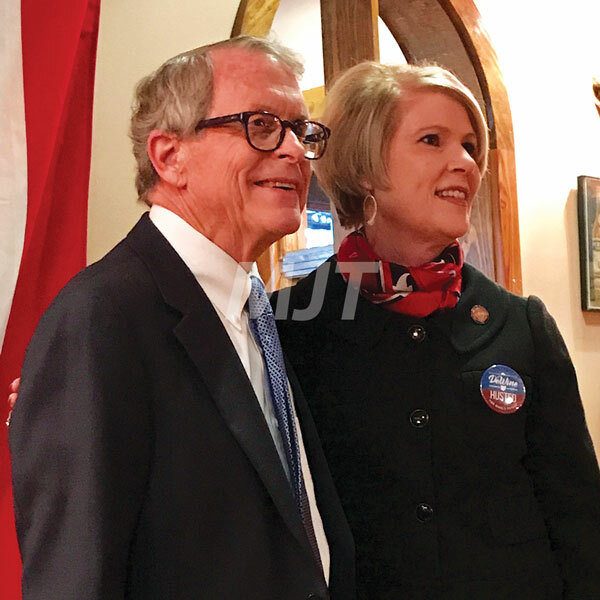 Governor-elect Mike DeWine, left, nominated Dorothy Pelanda, right, to be the director of Ohio’s Department of Agriculture on Thursday. She said her agricultural background and time spent as a former State Representative for Ohio’s 86th District will serve her well in this position. Governor-elect Mike DeWine has nominated Dorothy Pelanda to be the next director for the Ohio Department of Agriculture. Pelanda served as State Representative for Ohio’s 86th District, representing Union County, from 2011 to 2018. She is a graduate of Marysville High School who has practiced private law for 30 years. She’s lived on a farm in Marysville for all of her life said she and feels very close to agricultural issues, such as wildlife management and soil and water conservation. “So many of the issues we deal with in agriculture… are things I’ve lived with every day, and those feelings and values are innate,” Pelanda said. She said while a legislator for two terms, she served on the Agriculture Committee. Pelanda said she was selected by DeWine to “push the reset button” to resolve environmental issues farmers have been “passionate about” but have been at a statemate, particularly the algae problems in Lake Erie. Pelanda said she believes her agricultural and law background will help her in this position. Pelanda said Department of Agriculture responsibilities include dealing with invasive plant species, inspecting meat for consumption and making sure animals coming to state fairs are healthy. The department also works to make sure puppies are healthy to sell, amusement park rides are safe to use and soup cans are accurately portraying the size they advertise. Pelanda said she plans to visit many parts of the state to “build relationships and partnerships” with farmers and other “interested parties so we can move forward and protect families.” She said this, as well as working with the Farm Bureau, will be part of what she does in the next 90 days. Tim Derickson was the interim director of the Department of Agriculture before Pelanda’s nomination. She said Derickson will work as her assistant director. She said since both of them have worked in the legislature before and have agriculture experience. “I know we’ll work very well together to make our department the best it can be,” she said. Also nominated to DeWine’s cabinet is Jillian Froment, who has been the director of the Ohio Department of Insurance since 2017. She will remain in that position. Froment was the city administrator for the City of Marysville and the inaugural executive director for eTech Ohio.